Goodness another week has gone by, and I still can’t believe that this wee linky is very nearly 50! – that means we have been going for almost a year. I hope you have enjoyed popping in to see us every week? We have certainly enjoyed hosting you. This week, we are over on The Fairy and the Frog, where her beautiful blog is showing you the way with your parenting shenanigans. 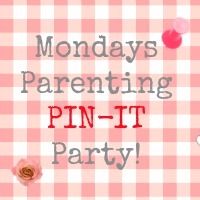 The rules are the same, so no need for me to go through it all for you – just get parenting and pinning this week!